Local Southlake Home Service Company, BERKEYS® Air Conditioning, Plumbing & Electrical, among those honored at the 2018 Consumers’ Choice Award Winners’ Event. I am so pleased that our customers took the time to vote for us to win this award. Everyone at Berkeys truly deserves credit for this achievement. Over 60 companies gathered at a recent dinner event honoring recipients of the 2018 Consumers’ Choice Award. Winners represented industries ranging from Home Services to Health and Beauty. The CCA is dedicated to identifying and promoting businesses that exemplify superior customer service, integrity, and professionalism. Its goal is to recognize and nurture business excellence through customer service reviews and recommendations for the benefit of local enterprises and the customers they serve. With the assistance of a third-party polling company and its own on-line voting site; VoteDFW.com, Metroplex consumers were able to vote for their favorite companies. Winners were identified based on the results of almost 10,000 votes. To qualify as a Consumers’ Choice Award recipient, companies must also exhibit a history of business integrity. 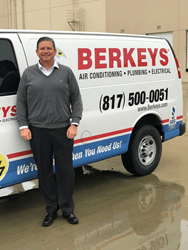 BERKEYS® has become one of Dallas, Fort Worth’s largest, most recommended, award-winning home services contractor, specializing in air conditioning, indoor air quality, plumbing, drain, sewer and electrical services. Founded in 1975 and Headquartered in Southlake, Texas, BERKEYS® has met the needs of thousands of homeowners across the Metroplex. Their excellent service record has enabled them to glean additional awards and accolades including Southlake Style’s “Best of” list for 4 years in a row, and Angie’s Super Service Award. In addition, as of this press release, BERKEYS® is A+ rated on the BBB website with 249 reviews averaging a five-star rating. For more information about the Consumers’ Choice Award visit ConsumersChoiceAward.com.